Wednesday: I need something WW friendly & STAT! Hence, this crazy filling & quick pho recipe was born. Not even going to sugar coat it, I totally winged (wung?) this dinner. The last two days have been pretty shaky, having finished off an entire pint of Halo Top Monday night (yay stress eating), plus inhaling PJ Whelihan’s garlic parm wings along with the most DREAMY cookie dessert ever on Tuesday night. Safe to say I was feeling a little anxious and desperate for something that at least resembled a vegetable. It was then when my craving for pho struck (and I’m not even a soup person)!. This lil Italian has had pho numerous times at Vietnamese restaurants, but I’ve never actually attempted to make any myself. The pho I ended up throwing together is based on my usual go-to whenever I’m dining out…a big ol bowl of tofu vegetable pho! Not to toot my own horn here, but I will say it came out tasting pretty darn close to the original, minus the fact I didn’t have all the ingredients needed to 100% recreate (mini corn, bean sprouts & bamboo shoots would have helped, but the nearest H-mart is just *too* far away). I also added made my Weight Watchers adjustments as well; for instance, rather than utilizing rice noodles, I substituted with a whole bag (1 SP) of House Foods Tofu Shirataki Noodles. Keep reading to see how I created this easy and delicious pho! Wash the scallions, bok choy, mushrooms, & cilantro leaves. Slice & set aside. Take out & drain the firm tofu (I used House Foods). Cut out a 1/4 amount section from the block and begin drying with paper towels. Drying out the waterlogged tofu is crucial to getting it browned when cooking. After absorbing most of the water, slice up the tofu into cubes & set aside. Drain the shirataki noodles, rinse them with cold water in a strainer and let dry. In a medium-sized pot, pour in your vegetable and chicken broth and simmer on a low heat. Add in cilantro, scallions, soy sauce, salt & garlic powder to the broth for flavor. 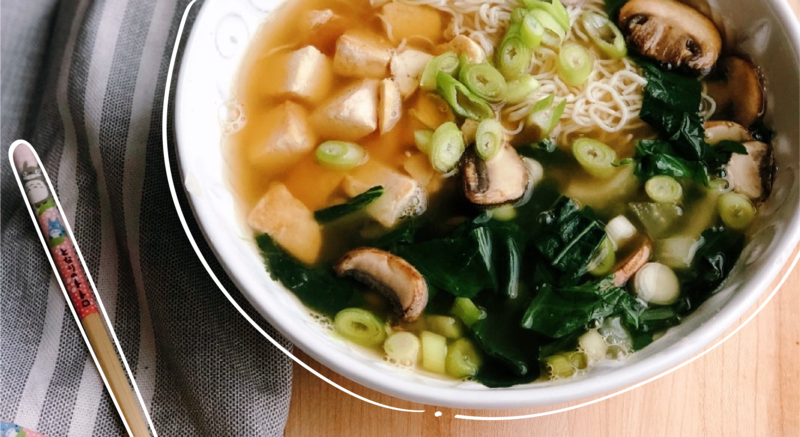 While the broth is heating, begin drying out your noodles & tofu in a frying pan using a little bit of cooking spray on a medium-high heat. Add a dash of salt, garlic powder, ginger and soy to your tofu for some extra flavor, along with the diced garlic. Once the tofu is browned and your noodles are dry (make sure not to brown them), set them aside on a spare plate to cool down and dry up further. In the same pan, fry the mushrooms and bok choy, then season with salt, garlic & pepper. Once cooked, add to simmering broth. Optional: add a few strips of the cooked chicken breast to the broth. I happened to have some rotisserie chicken in so I grabbed from there. Add all ingredients to the broth and let simmer for 5-10 minutes for flavor. Serve & garnish with some more scallions if you’re feeling extra! And that’s it! Let me know if you give this recipe a try and what you think. It definitely hit the spot for me. As always, wishing you a happy and healthy rest of your day. P.s. Give this recipe a pin if you liked it!